Saturday, anti-Semitic pamphlets were dropped in one of Bozeman's neighborhoods, this is the second time this has happened to those residents in 10 days. Sunday, anyone that opposes these types of ideals was asked to march to the Bozeman Library. 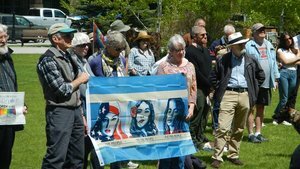 The Montana Racial Equity project and the Montana Human Rights Network organized the walk and rally to spread the word of unity among Bozeman residents. To raise awareness to the community as a whole not only that this terrible thing has happened but that we will always resist it and oppose it and stand together as a community." Said Dan Lourie, a victim of the anti-Semitic literature. Around 30 people marched down Main Street holding signs expressing love and equality.